Smile proudly - free from missing teeth! Missing teeth can make life miserable. You won’t have the courage to smile, and you won’t be able to chew perfectly. Improper dental practices, gum disease, aging, and accidents might be the cause of your missing teeth. However, a visit to the dentist might change your life. One of the options the dentist can use to give you a perfect set of teeth is partial dentures. This is a dental procedure that seeks to replace only a few missing teeth. When you have missing teeth, the remaining ones will seek to fill the spaces on either side. This can damage the delicate tissues of your mouth. You also face the risk of tooth decay or gum disease, which leads to the loss of more teeth if left untreated. Partial dentures fill up the spaces and prevent existing teeth from shifting. The dentures also give your cheeks a fuller look and support your lips. They also give you a larger surface area to chew your food. Every person has a different dental formula. This is why you will need dentures to be custom made to fit your problem. Creating your dentures requires you to visit the dentist four or 5 times. The first visit is for the dentist to take x-rays as well as examine your teeth, jaws, and tissues. The dentist then creates 3D impressions of your teeth from which to make the dentures. The second appointment is all about the minor reshaping of your teeth. By the third appointment, dentures will be available and the dentist tests them for proper fit and comfort. If the dentures don’t fit perfectly, the dentist recommends changes. The fourth visit is for fixing the newly adjusted dentures. The fifth visit might be for checking your progress with the dentures. 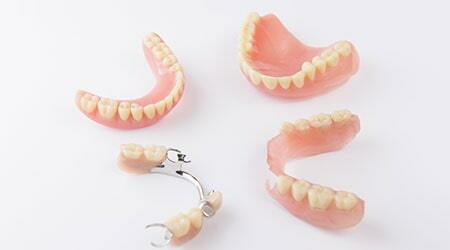 You might require removable partial dentures or permanent partial dentures. You can reach this decision by talking to the dentist. The dentist will give you the best option depending on the findings after assessment. Partial dentures are more stable as compared to complete dentures. This is because they can be anchored to the remaining teeth. However, even with this, the teeth gradually wear out over time. When this happens, they have to be re-aligned by the dentist. Realignment is necessary because at some point your tissues and bone structure change due to normal growth. Are you the right candidate for partial dentures? Apart from the missing teeth, other factors determine whether you are the right candidate for the procedure. Your supporting tissues need to be healthy to support these dentures. You also need to be in good health and a desire for the prosthesis to be placed. You also need to be motivated to maintain good hygiene so that you keep the dentures in good condition. My recent visit to TLC Dentistry was absolutely wonderful I am always extremely pleased with them and I am happy that I found them l would definitely refer others to TLC Dentistry. TLC Dentistry of Salinas uses the latest dental technology to craft custom partial dentures for your missing teeth.